Speech is produced in the human cerebral cortex and previous studies have shown that the brain waves associated with speech processes can be directly recorded with electrodes located on the surface of the cortex. Now, researchers from the KIT and Wadsworth Center have shown for the first time that is possible to reconstruct basic units, words, and complete sentences of continuous speech from these brain waves and to generate the corresponding text. In effect the team have developed the world’s first working ‘Brain-to-Text’ system. The study is published in the journal Frontiers in Neuroscience. The researchers state that it has long been speculated whether humans may communicate with machines via brain activity alone. As a major step in this direction, the current study’s results indicate that both single units in terms of speech sounds as well as continuously spoken sentences can be recognized from brain activity. In the current study the brain activity was recorded from 7 epileptic patients, who participated voluntarily in the study during their clinical treatments. An electrode array was placed on the surface of the cerebral cortex (electrocorticography (ECoG)) for their neurological treatment. While patients read aloud sample texts, the ECoG signals were recorded with high resolution in time and space. Later on, the researchers analyzed the data to develop Brain-to-Text. The researchers state that to their knowledge this is the first system that decodes continuously spoken speech and transforms it into a textual representation. For this purpose, cortical information is combined with linguistic knowledge and machine learning algorithms to extract the most likely word sequence. Currently, Brain-to-Text is based on audible speech. However, the results are an important first step for recognizing speech from thought alone. The team note that these results were obtained by an interdisciplinary collaboration of researchers of informatics, neuroscience, and medicine. The methods for signal processing and automatic speech recognition have been developed and applied. In addition to the decoding of speech from brain activity, the new models allow for a detailed analysis of the brain areas involved in speech processes and their interaction. In addition to basic science and a better understanding of the highly complex speech processes in the brain, the team surmise that Brain-to-Text might be a building block to develop a means of speech communication for locked-in patients in the future. Speech Recognition from Brain Activity. 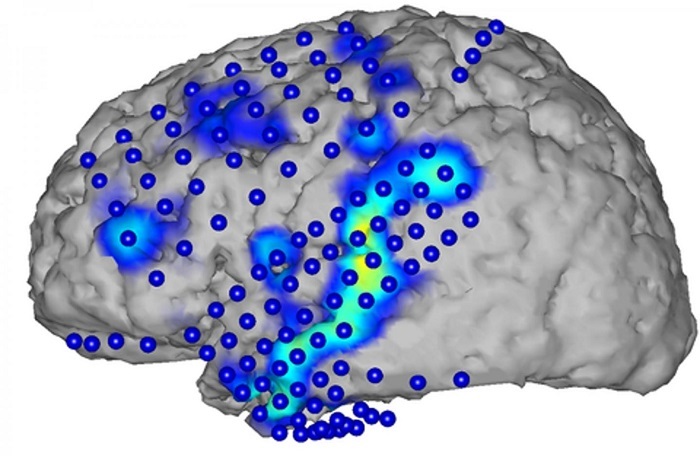 Brain activity is recorded by electrocorticography (blue circles). From the activity patterns (blue/yellow), spoken words can be recognized. Credit: Figure: CSL/KIT.